Congratulations to our very own Shay, Rona and all the team on successfully winning a seat on Wicklow Co. Co. It was a long weekend but well worth waiting for! We know Roundwood will be well looked after for the next five years. Best of luck to you, Shay. The Roundwood Active Retirement and Whist committee have organised a day tour on Thursday 10th July to Farmleigh House, PhoenixPark and a Liffey Cruise, passing the Four Courts and Customs House. Evening meal on the way back and bus provided. Total cost €50. To book please call Molly at 0404 45407 or Betty at 01 2818703. Cardiac first responders would like to invite everyone to Roundwood Parish Hall after mass on Saturday 14th June to promote the Lions Clubs’ “Message in a Bottle” scheme. We hope to have some guest speakers to discuss good health and we will have some music, dancing and singing on the night. So put Saturday 14th June in your diary and come and join us for an informative and fun evening! The Roundwood Festival 2014 is due to take place from the 18th to the 20th of July. If you are interested in getting involved or have any suggestions or new ideas to add to this fun weekend please come to the next committee meeting which will take place in the Old School Roundwood on Tuesday the 3rd of June at 8pm. All welcome. A mass for all students sitting the Junior and Leaving Cert exams in our Parish and the surrounding areas will be held on the Bank Holiday Monday 2nd June at 11 am in RoundwoodChurch. We invite all students, their families and friends to come along and celebrate this Mass together before sitting their exams. A story telling night will take place in Annamoe Community Centre on Friday the 13 June at 8pm. All are welcome to a very entertaining night. The Wicklow Man will play in Moneystown Community Centre on Friday June 13th from 9.30 till 12. Teas, door prizes, refreshments. Come along n enjoy a night of waltzing, jive, etc. St. Kevin’s Way – A One-Day Camino to Glendalough This year, to celebrate the Feast of St. Kevin, two walks have been organised, for 31st May, 2014. Walk 1: for the seasoned walker, will consist of 7 stages: 9.00 a.m. to 4.00 p.m. Stage 1 starts, at 9.00 a.m., at the Church in Hollywood, Co. Wicklow, led by Fr. Kevin Doran and ends at 4.00 p.m. at the Upper Lake. All pilgrims from both walks will assemble here for a concluding prayer led by Fr. Michael Rodgers and Bernie Healy. Participants are asked to wear suitable clothing and footwear, for their chosen walk. A walking stick is advisable. Time will be allocated for a lunch break on Walk 1, so please bring a packed lunch and drinks. There will be 2 water stations en route. Through participating in one of these walks, you are being invited to bring the sacred into your everyday. In order for us to have an idea of numbers, we would appreciate if you could register with Glendalough Hermitage Centre in advance and indicate the stage at which you plan to start. Please contact Glendalough Hermitage Centre: (087) 9356696. No registration fee. At the UpperLake, a box will be provided for a donation towards Mountain Rescue. We hope that this will become an annual event to celebrate the Feast of St. Kevin. Congratulations to the Djouce Cullen Cup Team who were winners in a very closely fought match against the Glen of the Downs Cullen Cup Team held at Djouce Golf Club on Saturday 24th May. The match was played in challenging conditions following heavy rain but both teams produced some great golf with every match reaching the eighteenth green. Five mixed pairings represented the club and the team secured three wins to win the match. Well done to the pairings of Joe Kavanagh & Margaret Bolger, Paul Kinsella & Deirdre Carroll, Michael Bolger & Helene Duignan, Ian Barnes & Margaret Schutte and Jim Campion & Janet O’ Toole. Many thanks to Donal for preparing the course for the day. Good luck to the team in the next round of the competition. Our annual charity BBQ will take place on Wednesday 18th June at The Complex. This year the proceeds will go towards the Áras an Tochar Building Fund. A fun filled evening is planned, with obstacle races, relays and races for kids, a Fit for Life Race for our Junior & Senior athletes. Along with the BBQ, we will have face painting, a raffle, spot prizes, and music. Everyone is very welcome to come along for what will be a great night of entertainment, hope to see you there! 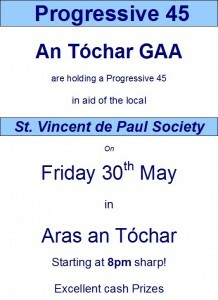 An Tochar GAA Club is holding a Progressive 45 Card Game in aid of the Local St. Vincent de Paul Society on Friday 30th May, starting at 8 pm. Next whist will be on tonight Wednesday 28th May in the Parish Centre. End of season prizes were presented on Monday 12th May with Phil Power taking 1st place 2nd went to Catherine McGillycuddy, 3rd Nancy O’Brien, 4th Paddy O’Brien and Brid Clancy took 5th. North/South results for the night 1st Teresa Leahy and Marion Davis, 2nd Nancy O’Brien and Brid Clancy joint 3rd/4th Margaret Byrne, Maura gaskin, Molly Byrne and Rachel Judd. 1st for East/West Kay Plunkett and Mary Pierce, 2nd Paddy O’Brien and Ger Lenihan, 3rd Monica Brady and Bridie Nolan. Many thanks to everyone who supported our Benefit night on Monday 19th May, a great night was had by all and over £1000.00 euros was raised for the Community Hall. Bridge continues on Monday nights at 7.45 and is open to all players. Presentation of end of season prizes was made on Friday 16th May with Noeleen Redmond taking 1st place just 2 points ahead of her regular partner Margaret Bolger who was 2nd, 3rd Jim McNamara, 4th Ger Lenihan and 5th Monica Brady. North/South results on the morning were 1st Noeleen Redmond and Mary Pierce 2nd Monica Brady and June Digby, 3rd Jane Cronin and Gertie Fee 4th Seamus Kennedy and Ann Kennedy. East/West 1st Maria Magee and Jim McNamara, 2nd Paddy O’Brien and Ger Lenihan, 3rd Rachel Judd and Molly Byrne and 4th Teresa Leahy and Marion Davis. Bridge continues on Friday mornings starting at 9.45 and open to all players. Field Events Girl’s U 12 Shot Putt Silver -Eve Leacy,U 13 Shot Putt Gold-Rebecca Molloy,U 16 Shot Putt Gold-Laoise Cullen,U 16 Discus Gold-Molly Hayes,U 16 Discus Silver -Laoise Cullen,U 16 Javelin Gold-Laoise Cullen,U 12 High Jump Gold-Eve Lacey, U 13 High Jump Gold-Rebecca Molloy,U 12 Long Jump Bronze Eve Lacey,U 13 Long Jump Silver, Rebecca Molloy-U 16 Long Jump Silver-Clare Byrne Boys Relay’s U 9 4 x 100m Gold-Eanna Nolan, Denis Leacy, Jack Daly & Tom McKenna, U 10 4 X 100m Silver-Cameron Brady, Denis Leacy, Eanna Nolan & Tom McKenna,U 13 4 X 100m Silver-Roan Hayes, Darragh Fee, Jordon Byrne & Sam Herman Girls Relay’s: U 9 4 X 100m Gold Rachel Leacy, Chantelle Heatley, Orla Fee & Evie Vigors, U 10 4 X 100m Silver-Tess Ryle, Aimee Byrne, Chantelle Heatley & Orla Fee, U 13 4 X 100mBronze-Eve Leacy, Zoe Herman, Rebecca Molloy & Izzy Ryle. There was no winner of last week’s jackpot. The numbers drawn were 3, 5, 11 & 17. There were nine match three winners, Jasmine Campion, Caroline Campion, C & S Campion, Neil Foot, Helen Brady, Dolores Keeley, John Lowe, Aine Mulvey & Laurenz Weber. Next week’s jackpot will be €7,400. This entry was posted in News & Events on May 26, 2014 by roundwoodiewicklow. This entry was posted in News & Events on May 19, 2014 by roundwoodiewicklow.